A real "Gold mark" it is not. Real leather it is, originally intended for shoe soles. Pößnecker Sohlengeld. 2 Tauschwertscheine aus Rindsleder, Pößneck/Thüringen 27. September 1923. 17 x 10 u. 7,5 x 6 cm. From the translation: Very rare specimen, since only 987 of this kind were ever made and most of these were (probably) indeed made into shoe soles after the inflation was brought under control. It is only alluding to the Goldmark which was in circulation before the war to inspire confidence. 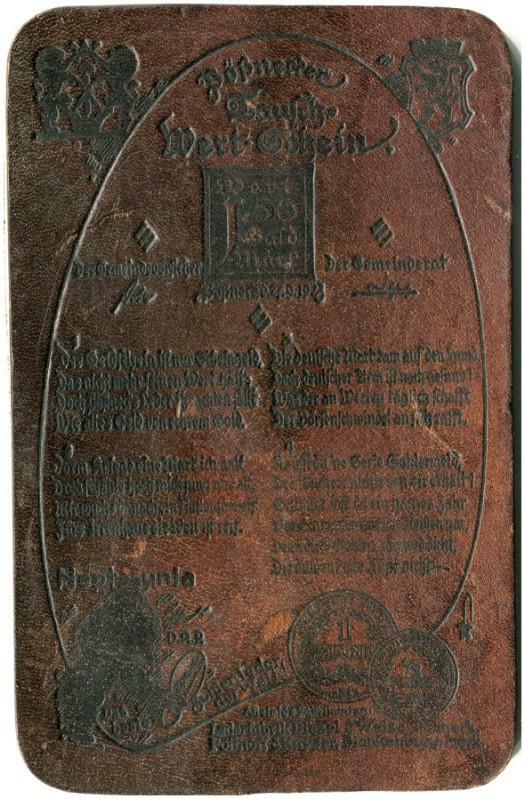 This notgeld was issued on September 27th, 1923, very shortly before the reforms that switched away from the inflated Papiermark and made the Rentenmark legal tender everywhere. 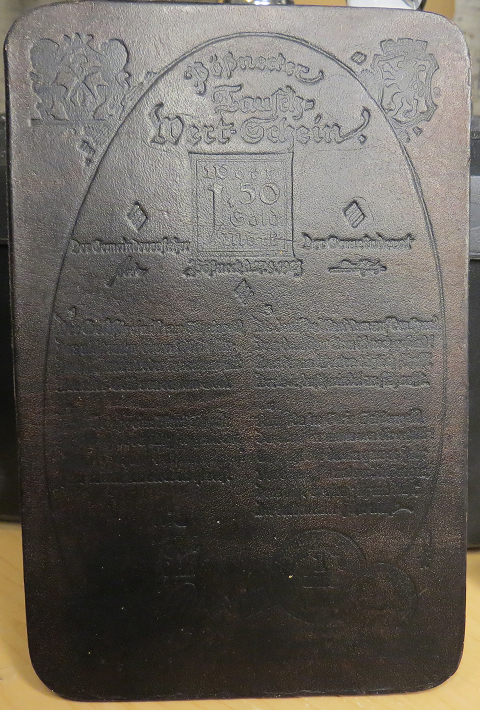 The Text on this specimen is somewhat hard to decipher. Doch deutscher Mann ist noch gesund! Der Börsenschwindel an sich rafft. Die dulden kalte Füße nicht. Neptunia. Das beste Sohlenleder der Welt. Lederfabrik Diesel & Weise, Pößneck. Potthoff & Kayser, Blankenburg-Mark. 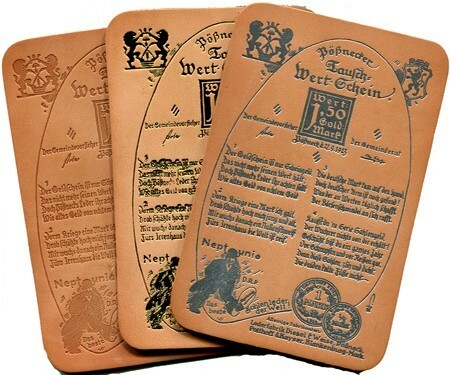 Paper money is just illusory, and cannot keep its value any longer, but leather from Pößneck you should accept, just like the money of old when it was backed by gold. Before the war I was worth one mark, and was in high regard by young and old, but then I grew a tail of nulls, now the world is ready for the madhouse. The Deutschmark has gone to the dogs, but the German man is still in good health! What he creates by hard days work, gets eaten by the swindle that is stock exchange. 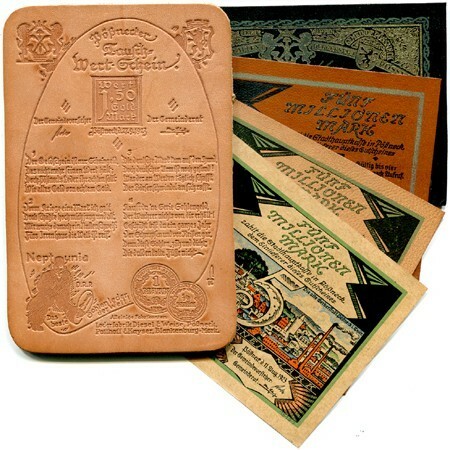 If you buy a series of Sohlengeld (the leather money), the usury gets nothing from you, you are protected for a full year, even from sniffling or ripping (~illness), because these soles, tough and tight, they do not tolerate cold feet. Note the distinction between creative capital and snatching (raffling, speculative) capital, a potentially antisemitic criticism of capitalism, exemplified in the 25-Points programme of the NSDAP, and making this little ensuring poem worthy of repetition in a nazi newspaper, years later: Litzmannstadter Zeitung 1941 kw IV Nr 311, p8.. This newspaper article also confirms that there was only a little run of 987 pieces. Not the answer you're looking for? Browse other questions tagged money numismatics weimar-republic german or ask your own question. What is the largest hoard of coins ever found?